I had posted this in a blog that I no longer publish. So for some this will be a repeat.I wanted to relay what it felt like when Bishop Museum‘s Ku was joined by two other Ku. 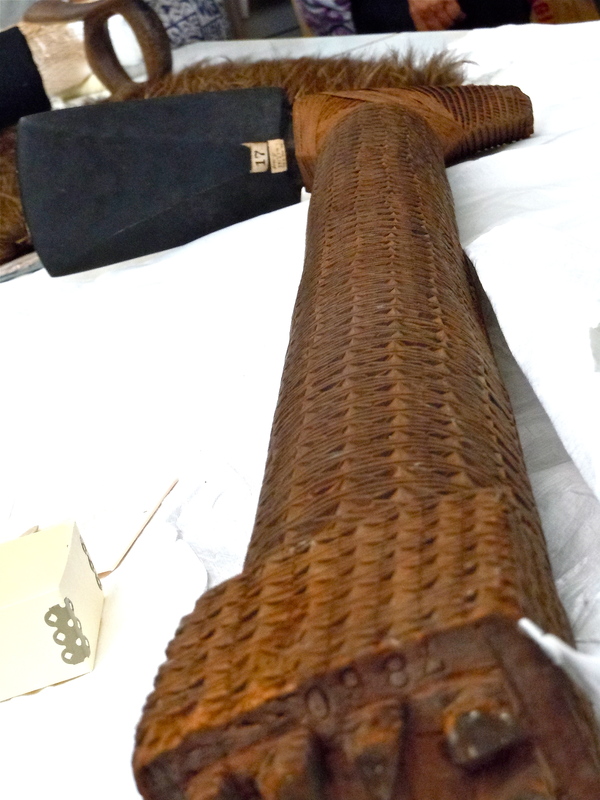 They were on loan from the Peabody Museum in Massachusetts and the British Museum in London. 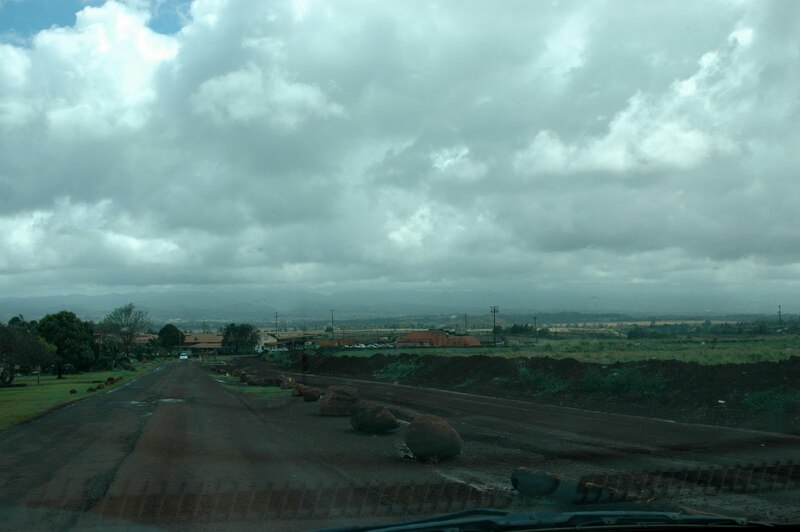 This was a very powerful event as these Ki’i had not been together in over a hundred years. At this point in time the two visiting Ku have gone back to their respective museums so you won’t be able to see them. But there is hope in that in the future they will come again. Until that time I will have it all in my mind’s eye. Again a special privilege for the docents to see this non public performance. 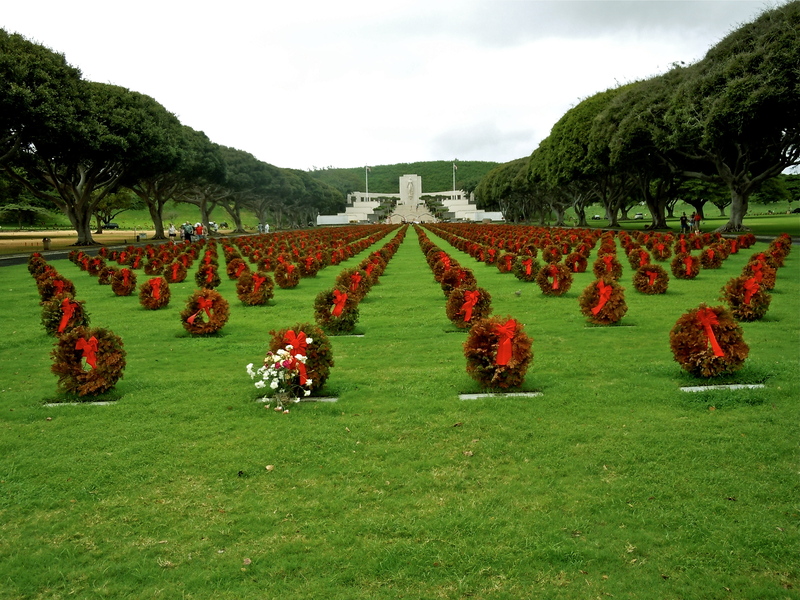 This is what took place as the hula halau paid their respects to the Ku. I would like to show you something through my mind’s eye because I could not use my camera. The sounds, colors and energy were such that it needed to be shared. Standing in my assigned area in Hawaiian Hall at Bishop museum I set my eyes on the blues and golds that the halaus (dancers) were wearing. The maile (fragrant leaves of deep green that drape the neck without connecting. )leis were draped around their necks and they wore gold haku (leis that are worn on the head) on their heads. They stood poised not moving. The ceremony to welcome and honor the three Ku was about to take place. From out side of the hall I could hear a voice, chanting, calling. As he got to the hall and entered with the Hawaiian words calling out, the drums began to beat a slow rhythm. No one moved in the audience. It was as though an electric charge was slowly rolling through out the hall. The hair on my arms started to rise as the dancers slowly moved their hips, their arms rhythmically moved through the air and they started to call out and began chanting too. The drums sounded stronger as the dancers began to recite and sing the praises of Ku. They chanted an introduction of who they were and where they had traveled. They called back and forth and all the time they kept dancing faster. I thought of all the ancestors whose spirits have been said to walk the hall, the two Ku that had not been home to the islands in over 170 years. What energy was being emanated as they were being honored and shown the respect that would have taken place had not the islands fallen into foreign hands. The power of the dance held me as though I were stepping into a time capsule and being planted back in ancient Hawaii. In that era from a safe spot I was able to watch a special performance that maybe at one time would have been preserved for only a very special few. The only sad part of the day for me was, I didn’t have my camera. As I lamented this fact to another docent he said as he pointed to his forehead, You have it here Karen, and you’ll always have it here. All information and research is done by this blogger and not Bishop Museum. If there are any errors (as there may well be) I welcome any corrections. As a docent it goes without saying that I love museums. Loving museums goes hand in hand with loving history which in turn means I just love artifacts. 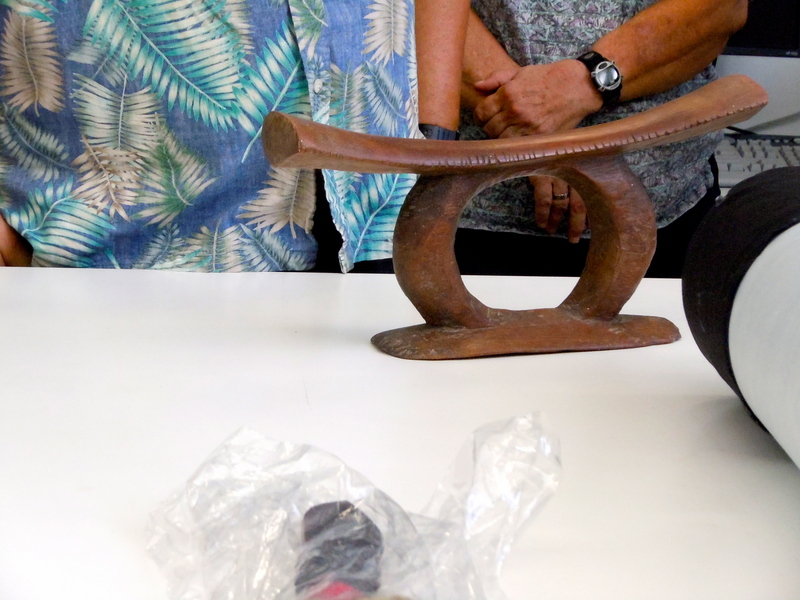 So when Bishop Museum offers the opportunity to go into collections and see artifacts up close many of us docents can’t get to that fourth floor inner sanctum fast enough. 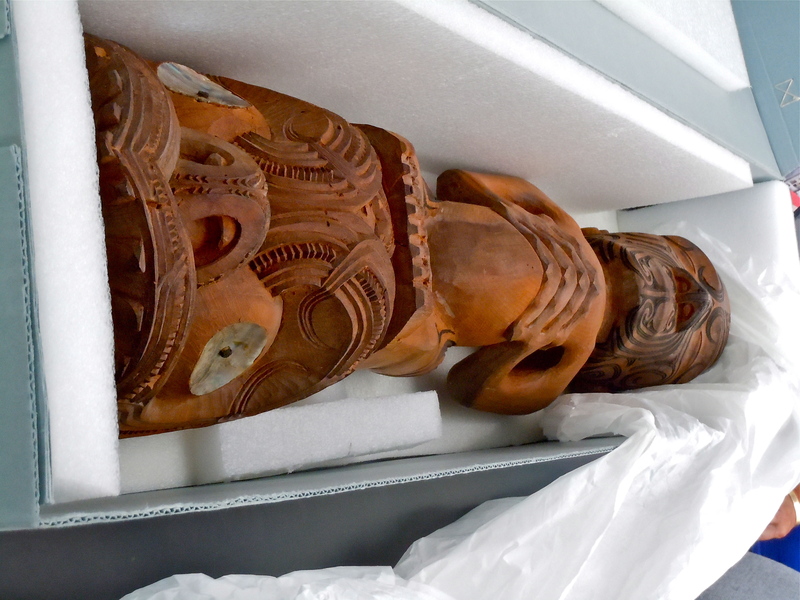 Last Thursday, we were invited to check out a few of the Pacific island collections that had just returned from touring China.The Pacific collection is housed in it’s own wing of the museum and it is a selection of precious relics amassed over time beginning in the late 1800’s when the museum first opened. Right now that wing known as Polynesian Hall is undergoing renovation. 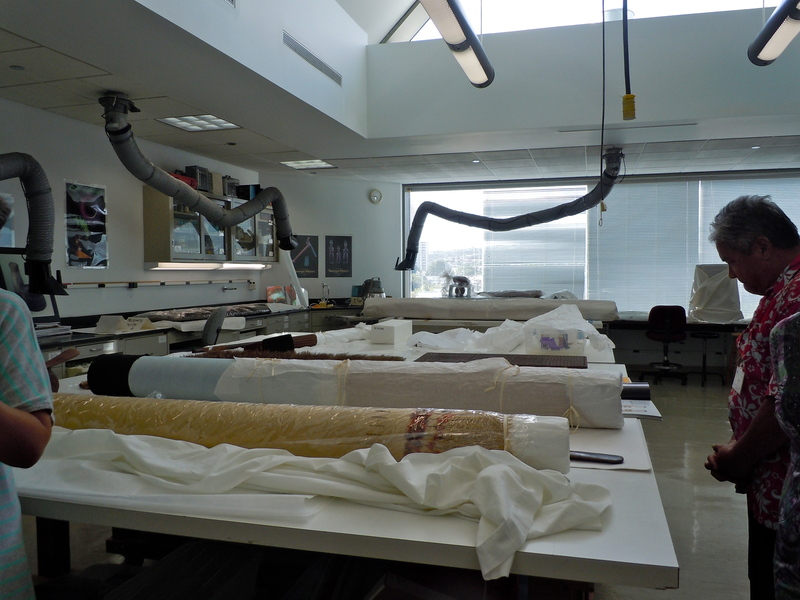 This is one of the reasons why the docents were invited to view the halls collection. 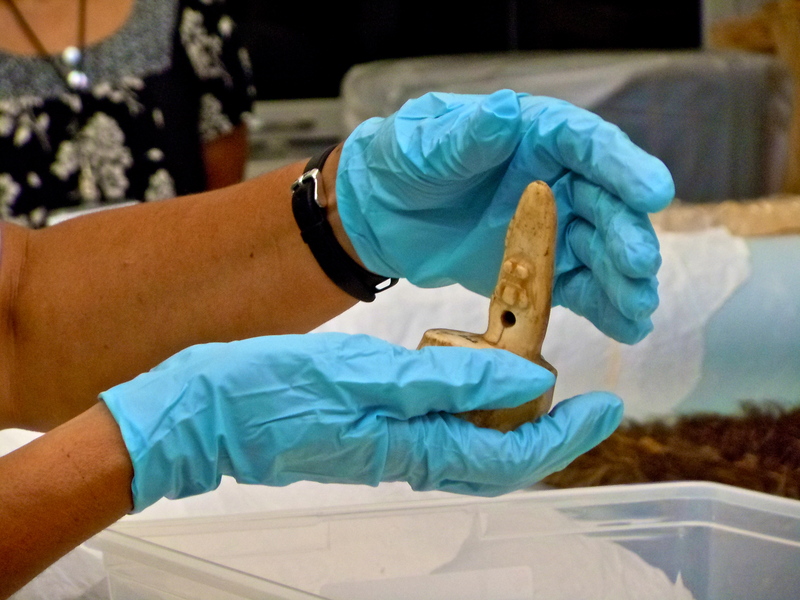 The Museum will be displaying a selection of items in “Longs Gallery” and so the docents need to be familiarized with what will be on display. Oh I just love this gig! 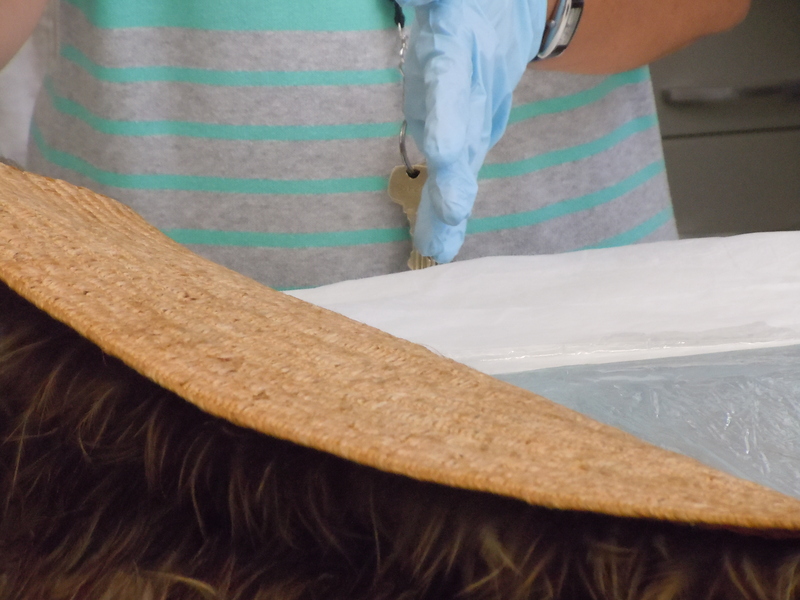 So we enter the stark white room after keys and codes are input into the system and the Vice President for Cultural Resources, Betty Kam, slips on her blue gloves and walks us over to the table containing many beautiful objects. Lovingly Betty goes over to a feather cape and tells us about it.The cape is Called a Kahu Kiwi and is made from the now endangered Kiwi bird. 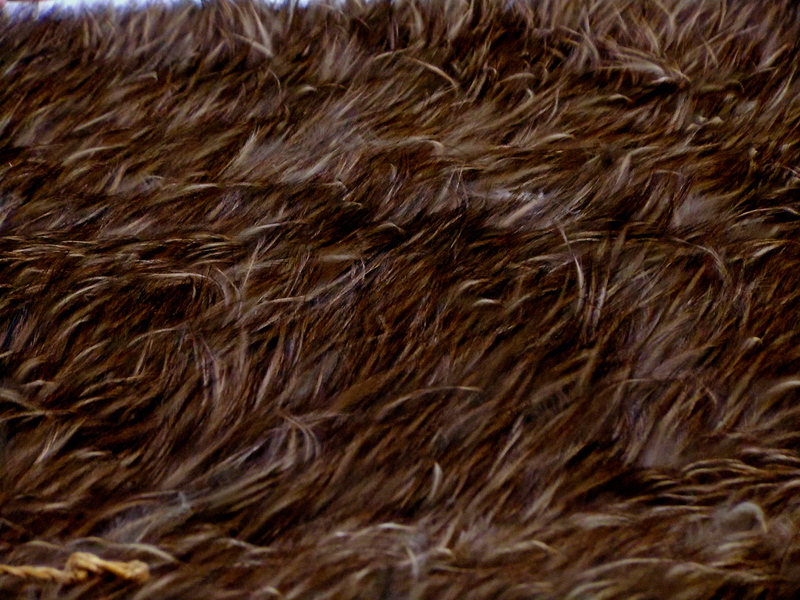 The feathers are attached in such a way that they curl outwards to that it gives the person wearing it the appearance of looking larger than they are. In nature the Kiwi also puffs out his feathers so that he too appears larger than he is. The chief slept with a headdress. When he slept, his head, which was considered sacred,would rest upon this implement so that it would not touch the ground. 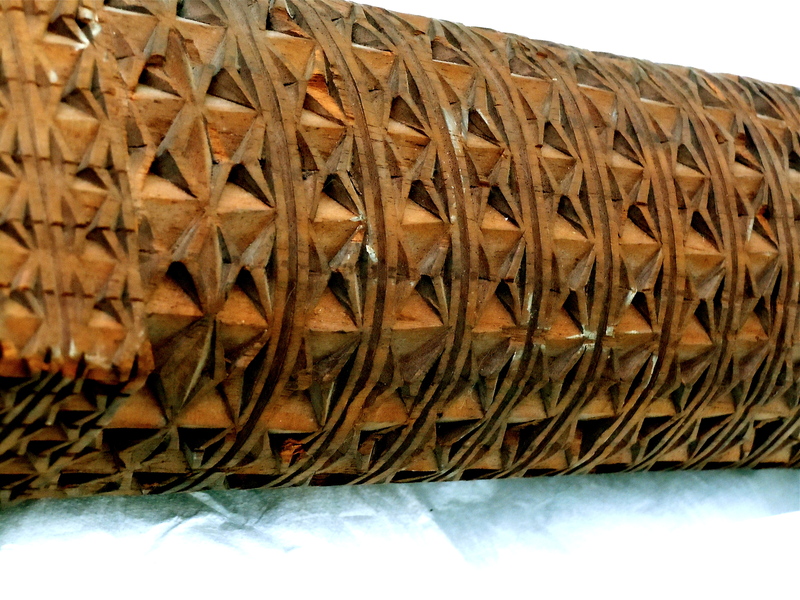 It is carved from one piece of wood and sometimes these headrest are decorated with shell or ivory. This particular one is formed by a bar that sits upon a circular support. 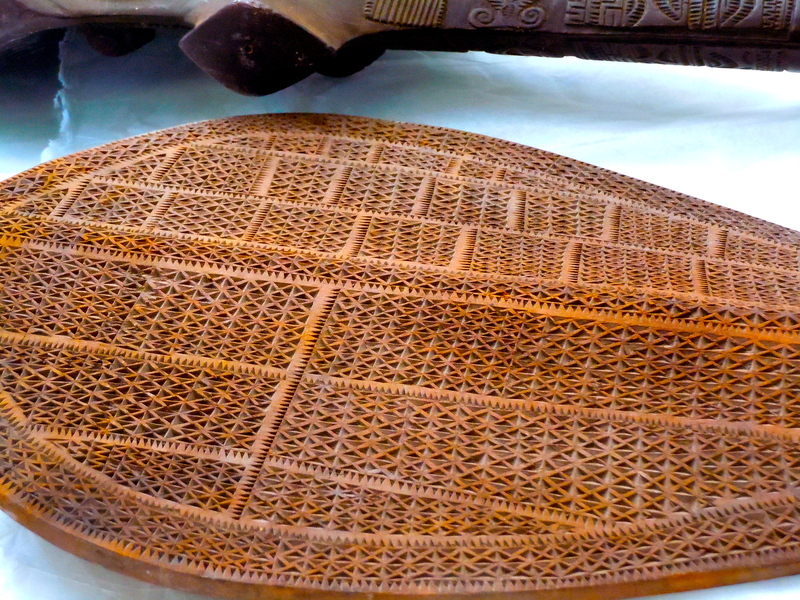 The faces on the top of this paddle show a female with rosettes in the hair, eyes, eyebrows and nose and mouth. These particular ear plugs were worn by men. They were inserted into the lobes of the ears. 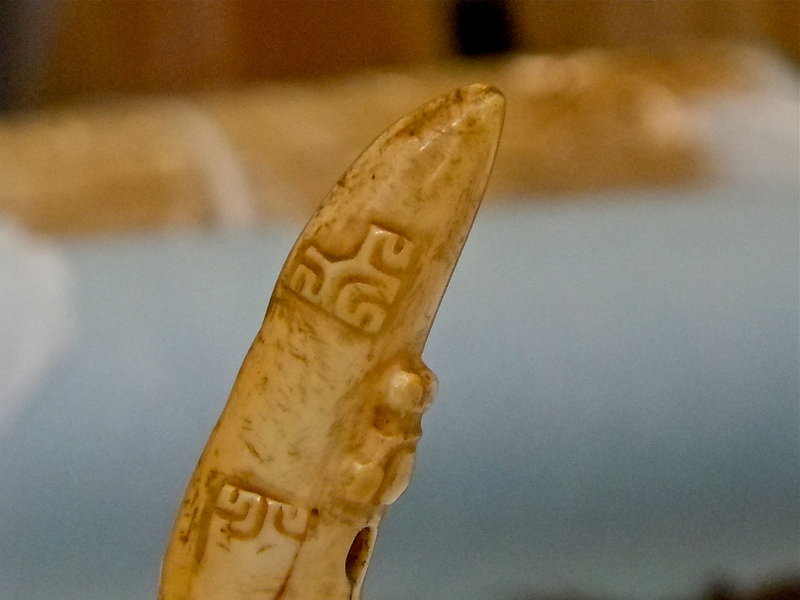 This one is carved from the tooth of the Sperm whale. The carved figures faced the back and the weighted end faced the front of the lobe. 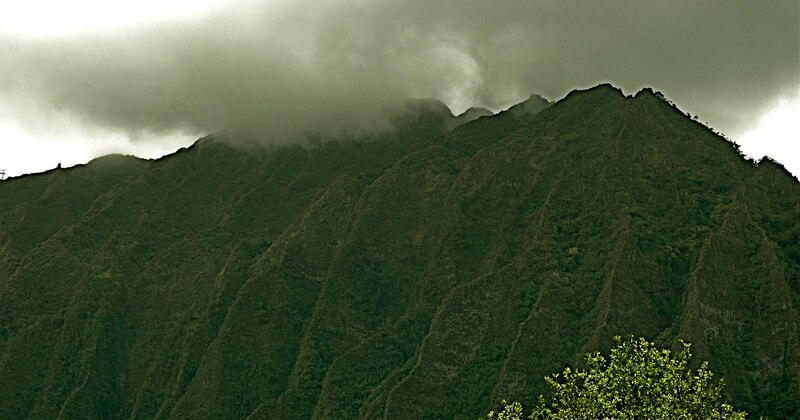 The headdress is called a pa’e kaha. 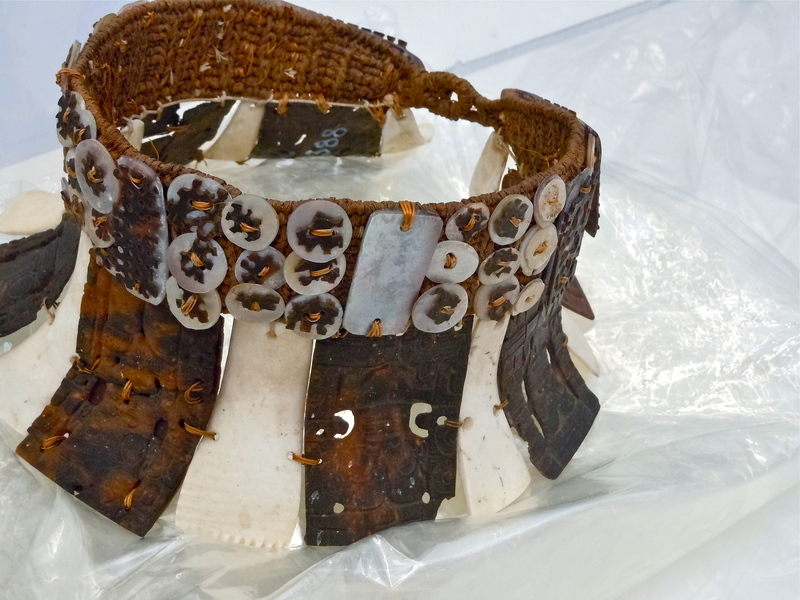 It is made from clam, turtle and pearl shell lashed together with coconut cordage. 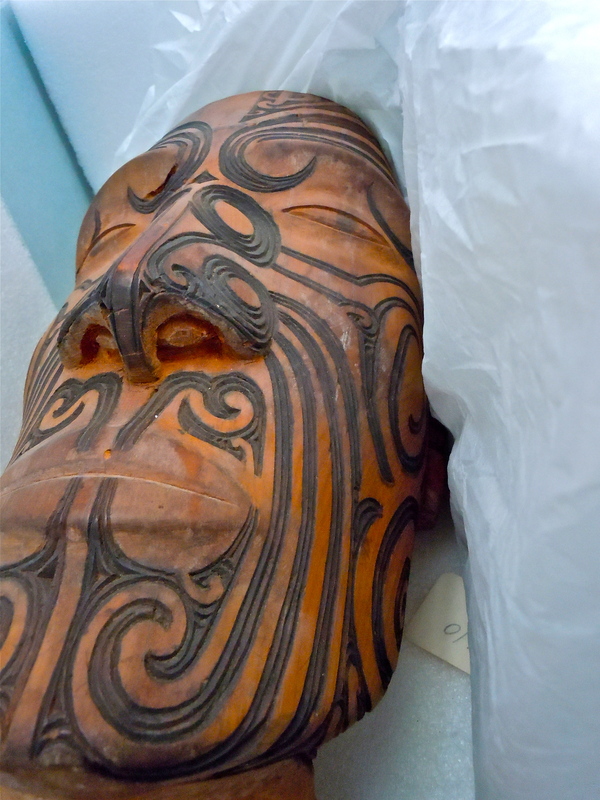 The designs on the turtle shell replicate the tattoo designs found tattooed on the Marquesans. The headdress was worn with plates down covering the eyebrows. 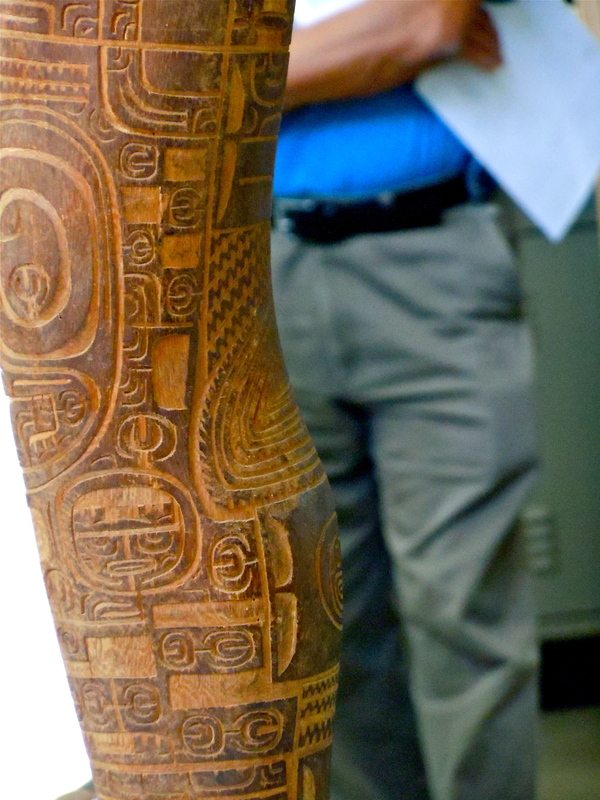 These intricate carvings show the designs that would have been seen on a tattooed leg of the Marquesans. A piece like this might have been made for a table. Such furniture filled a demand in Europe. 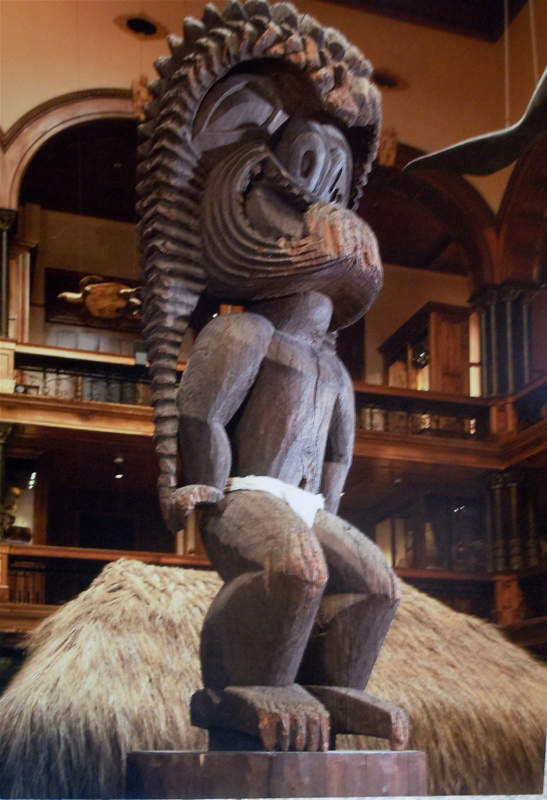 This was a post to a Whare Nui (Maori Meeting house) It was a gable figure on the house. It represented an ancestor who was greeted with respect as you entered the meeting-house. The figure is carved completely around and with lifelike form and detail. 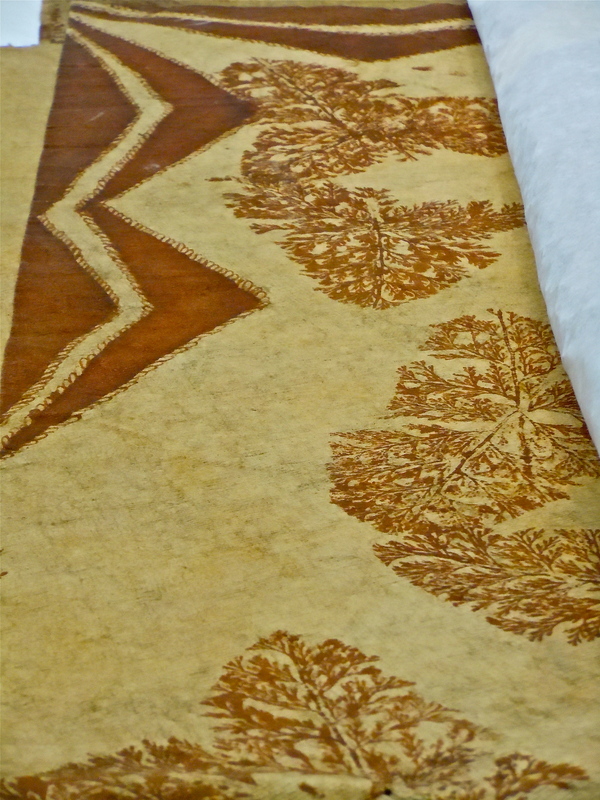 This Tapa or bark cloth made from the Wauke tree or Paper Mulberry is a beautiful example of the cloth that was made by Tahitians. Though we could not touch it, the appearance was that of a very soft material. The background is now faded but was originally yellow. 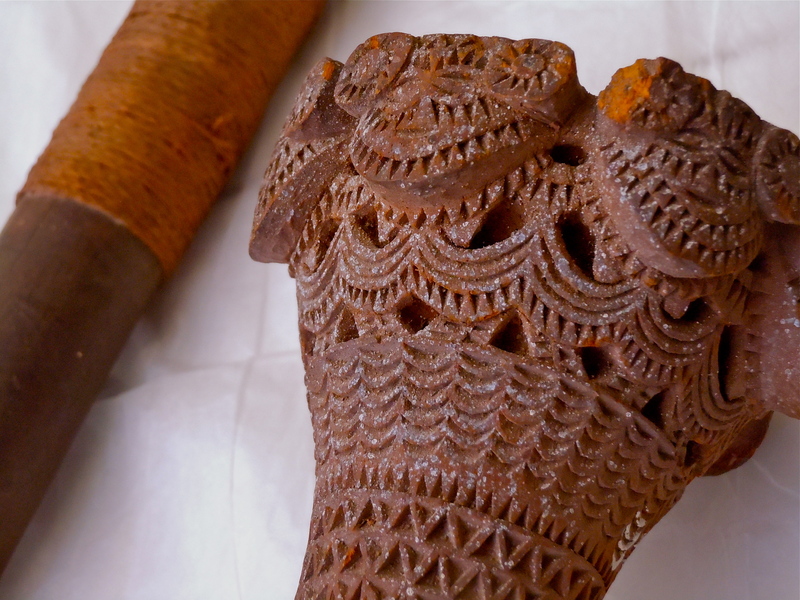 Not only were Adze tools they were also very important ceremonial instruments. This adze blade was made of basalt and attached with coconut sennit. As a docent and a lover of museums I am always impressed by visitors who come from abroad. Last week a fellow docent and I had the chance to talk to a visitor from Poland. 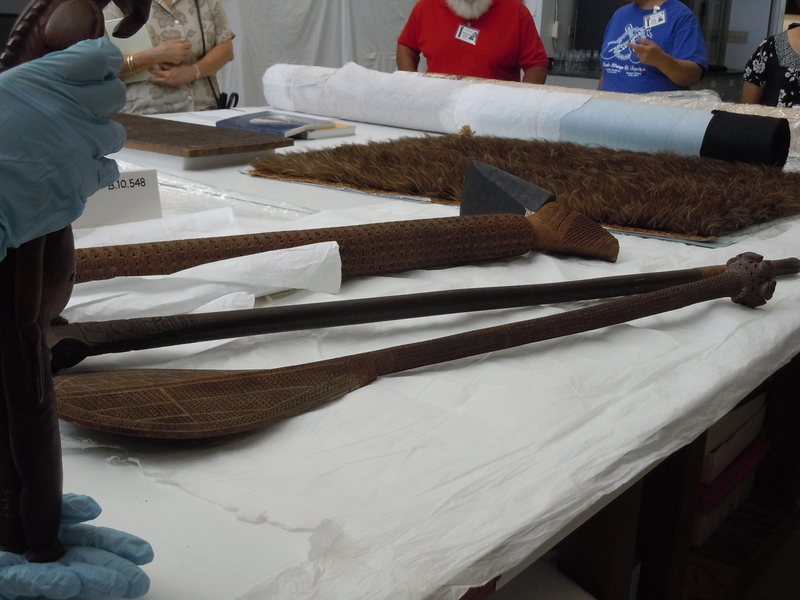 He was inquiring as to where he might be able to find a nice copy of the Kiʻi Ku. 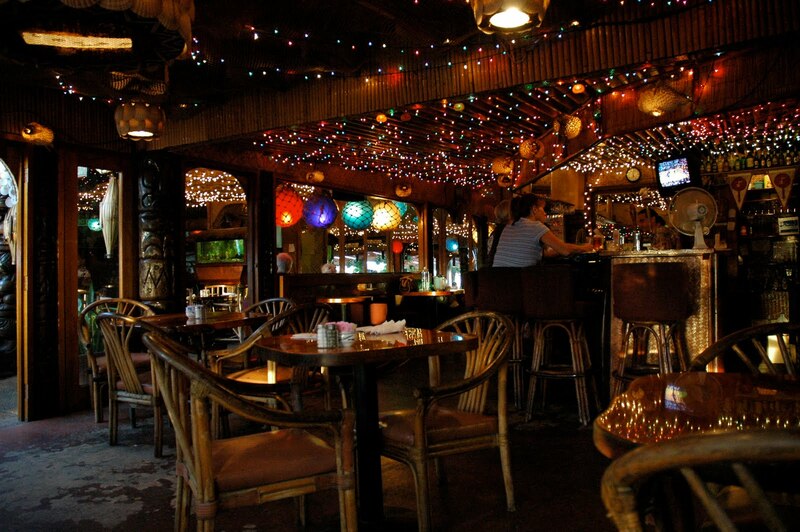 There are many cheap imitations of Ku to be had in drugstores or the market place in Waikiki that are made into plastic charms to be worn around the neck. But that was not what he wanted. He wanted a nicely carved image that would be a pleasant reminder of his visit. We told him that maybe he could find one in the museum gift shop or he could contact the carver who did exhibits at the museum. That was when he told us about his budget. He was a teacher in Poland and said he was paid the equivalent of $500.00 a month. The surprising factor in this conversation was that he paid as much for his commodities at home as we did here in Hawaii! How could he afford a vacation such as this one he was on now? Well it seems that many of our foreign visitors don’t look at a trip to Hawaii as a time to lay out on the beach and party hardy at night. They seem to genuinely be interested in the culture and while they are saving every little penny for this trip they are studying and researching. They arrive with a purpose. They’ve read and now want to see everything they can about the islands. 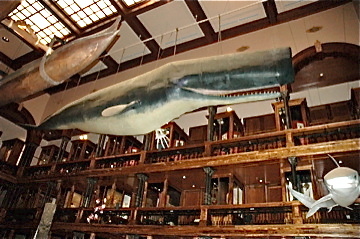 The trip to the museum is the grand climax to all that they have waited to see. The Ku would mean a lot to him and we understood that he did not want some cheap token but something that he could proudly show his friends. I am sure they would also learn of Ku through this memento of his trip. Knowing that he had such a restricted amount to spend we told him that just maybe he would find something at the swap meet and explained how he could get there. As he thanked us and went off to take in more exhibits my friend and I both agreed on a few things about this visitor. 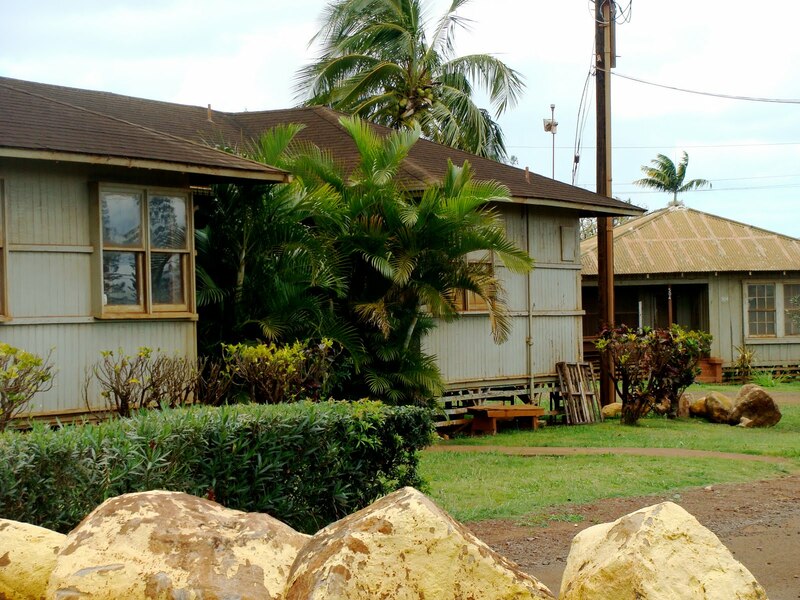 We were indeed very fortunate that we lived where we lived, and that we were able to meet such people who valued not just the Hawaiian culture but all cultures. This really put vacations into perspective. At Bishop Museum we meet them all. There is the loud woman who screams across the vast hall so that she can get her little daughter to pose just right even though this woman is disrupting a tour. She then is out of their in a blaze to go and scream somewhere else I suppose. Then there are the many visitors who rush in an hour before their scheduled to fly back home. As they enter the main hall with three floors of artifacts not to mention two other exhibit halls just within the main building they are stunned. This is an actual museum with hours of exhibits.They are always disappointed that they did not allow more time to visit the museum. Last, but to be sure not least, there are the people who like the Polish visitor who has planned and scheduled and is their from opening to closing. Me, I love them all. I can’t wait for my Fridays to come. Meeting the people and never knowing what is going to happen makes being a docent a very special undertaking for me. I hope that our visitor was able to find his “Ku.” I am sure it will sit in a place of honor as his visit was an honor for us. Sun, green mountain ranges, nor blue skies detour our mailman. No sleet or snow for him. 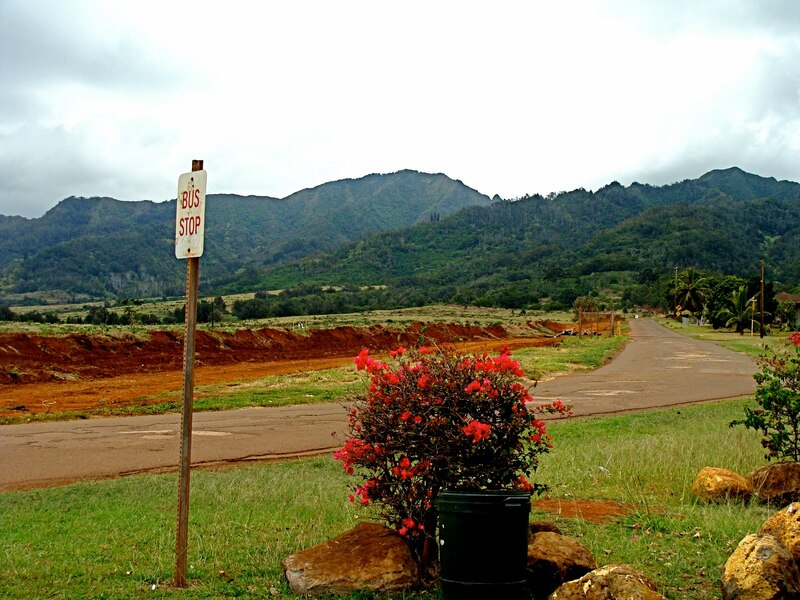 Our post mistress at the Kunia Post Office has to put up with the above view and friendly people who are enjoying another day in paradise as she disperses stamps, weighs packages or arranges passports. Driving up the road on my way to the post office I am banked by green ridged mountains. I love this little outpost. Even during the Christmas season when every postmaster is overwhelmed by lines of people bearing boxed gifts to be sent to far off places I know that I will most likely be able to walk right up to the postal window in this trailer and get quick, friendly, helpful and competent service. Even waiting for the conveniently, located bus can be a relaxing experience. All of these camp homes are close together in they are but a few minutes walk from each other. Yet they have more space between them then the new modern homes down the road where we live. Like my son-in-law is fond of saying, our houses are so close we know the neighborhood kids from point of conception. Our windows are too close for comfort. 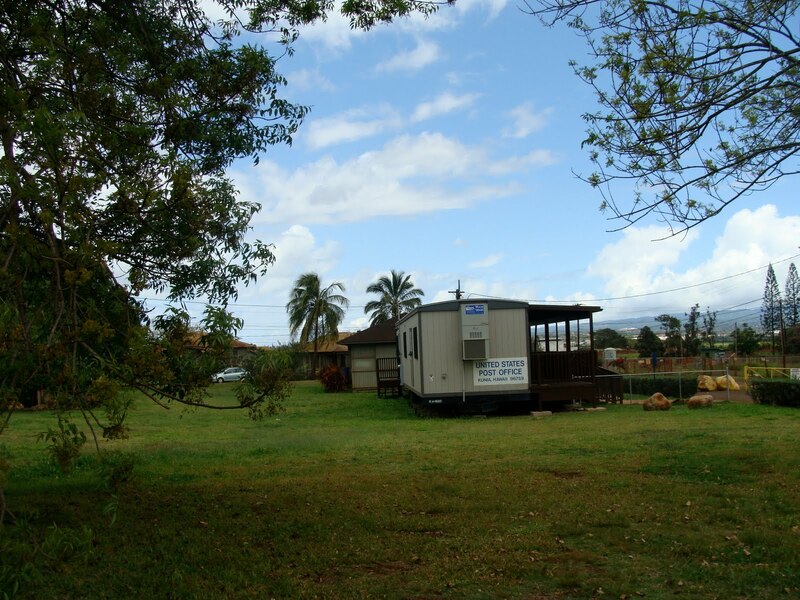 Kunia Post office is situated in the middle of a plantation camp. This was all Dole Pineapple until recently when Dole decided to close down. The workers who lived right here on this plantation were allowed to stay on until they could find other places to live. As it happened another big conglomerate, one that disturbs me, moved in and kept the workers on. Monsanto is now our neighbor growing their Frankenseed and secretly growing who knows what other monsters in their labs. Hmm, I wonder how long our mountains will stay green and the workers will stay healthy? Well at least I still have my post office. I’ll stay away from the corn, soybeans and who knows what else Monsanto has contaminated. But the little post office that could is still a part of my day. So far. With all of the post office closings I worry that Kunia Post Office might be on that list. So I buy stamps, mail packages and get my fill of post office gossip (psst did you hear the post office was broken in to?) while I can. If you live here in the Waipahu area and want a nice postal experience and maybe help to keep it open, here are the directions; Kunia Post office.